Gartner 2017 Magic Quadrant & UK Power BI Summit. I had the pleasure of attending, and hosting a data architecture roundtable at the UK Power BI Summit last week. The event was hosted by Jen Stirrup with Will Thompson and Siva Harinath from Microsoft Redmond facilitating both a hands-on workshop as well as a keynote going through the improvements being made to Microsoft Power BI that we’ll see in the near future. It coincided with the release on Thursday evening of the latest Gartner Business Intelligence and Analytics Quadrant. 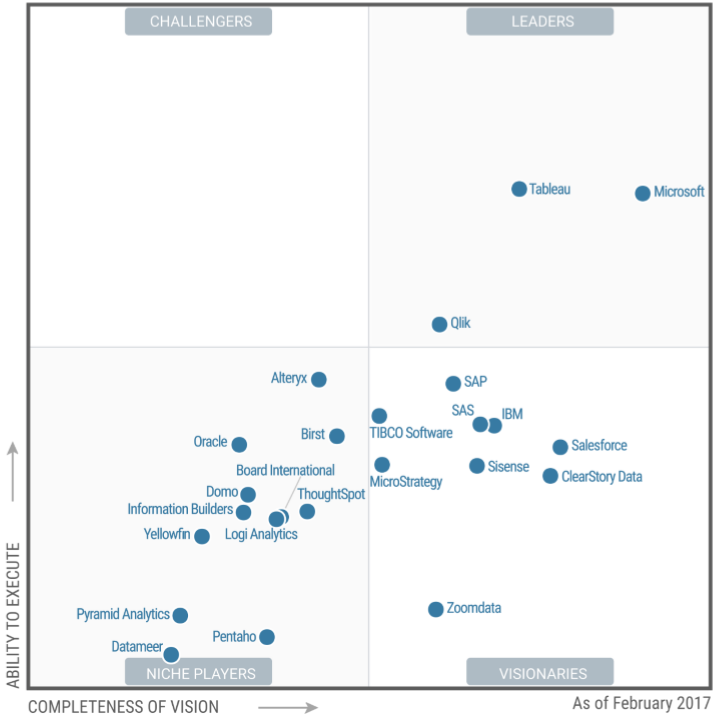 This was great timing for Microsoft as Gartner revealed that they are now in the top right quadrant (Leaders) in conjunction with Tableau and closely followed by Qlik. There were also representatives from other vendors, including Pyramid Analytics, in attendance. Pyramid were quick to point out that their solution surpasses Power BI in terms of completeness. The event highlighted the advances being made by Microsoft with its Business Intelligence software. However, as Pyramid Analytics were keen to point out, it has become clear that the future of BI is being pushed forward by niche players just as much as the leaders in the market. The niche players are providing small, but powerful developments that businesses using their software are reaping the benefits of. This is in turn pushing the leaders to adapt and improve their own software to retain their market position. The result of this is bringing businesses more return from investing in the right BI system. This competitive and fruitful Business Intelligence market does increase the difficulty of a key stage of any BI implementation. The selection of the BI software solution. It has been stressed before and cannot be stressed enough, software selection plays a fundamental role in an implementation project’s chances for success and tangible return. This had me reflecting back a couple of years when I engaged Optimum PPS to assist in a Business Intelligence implementation and help with the difficulties in knowing which solution to select. If you look at the latest quadrant there are a total of 24 players in the quadrant, and others that you could argue should be. I remember looking at the quadrant at the time and feeling overwhelmed, not to mention the 100+ pages of report to read if I wanted to go into the details behind this ranking. Gartner’s quadrant is based on five use cases and 15 critical capabilities which are assessed to generate the output you see below. While there is great value in going through these capabilities and they do form an important part of the decision, it was more important for me to understand what my requirements were by working with the information consumers in the organisation from the Senior Leadership Team through to the Shop Floor Operators. It is this factor that is key to selecting the “best” Business Intelligence and Analytics solution – determining the what, who and where of the information and evaluate the options against these factors. What: what processes are being supported? What types of decisions are being made? Who: who will have access? Who needs to do what? Where: where is the data now? where will it be integrated? Where will the information be consumed? When faced with the task of selection, it can be all too easy to exclude the vendors labelled as niche players or challengers. It may appear simple to concentrate this process on the 3 or 4 leading providers, but in reality taking this approach can be damaging to the implementation projects main goals. This is why it is vital to look at What, Who and Wheres before analysing the software solutions for selection. In other words, a robust requirements gathering exercise is required to gather the right level of data in order to answer these questions and eventually select the best solution for your situation. For me the UK Power BI Summit and Gartner Quadrant have further compounded this point. There is a perfect fit solution out there that will meet your business requirements. Take the time to set clear business targets, build an in depth understanding of how you want the solution to fit with your organisations operations, and be outline a roadmap of how you want your Business Intelligence implementation to develop in the long term. All prior to reviewing the software solutions available. This will leave you best placed to ensure both short term and long term return from your investment. Download our latest White Paper: Enterprise Architecture: Ensuring the foundations for a successful BI implementation.